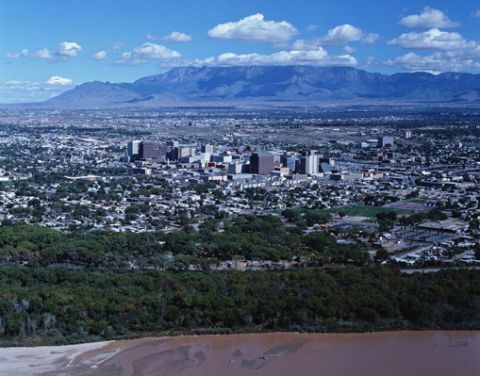 Founded in 1706 by the Spanish, Albuquerque, New Mexico today is home to over half a million people. Many historical buildings still stand in Old Town, which has evolved into a popular tourist destination with restaurants, bed-and-breakfasts, and shopping oriented around a traditional church and central plaza. The influence from the native Pueblo can still be felt in local arts and culture, as well as in historical landmarks such as the ancient rock carvings at Petroglyph National Monument. In more modern history, the vintage neon signs of Route 66 light up the center of town. Albuquerque's high desert location makes for sunny weather and wildly beautiful natural vistas year-round. The longest aerial tramway in the United States takes visitors to the top of nearby Mt. Sandia for a stunning view of Albuquerque and the surrounding plateau. • New Mexico - Find travel information, maps, tourist resources, and more photos of New Mexico. • City of Albuquerque - Visit the official Albuquerque, New Mexico city government site. • Albuquerque Convention & Visitors Bureau - Learn about Albuquerque as a convention and visitor destination. • Albuquerque Guide - Business directory and maps of Albuquerque, New Mexico.